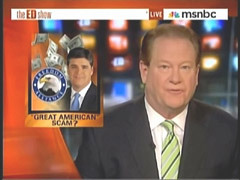 Ed Schultz rehashed an already-discredited smear of conservative talk show host Sean Hannity on the liberal talker's March 30 "Ed Show" program on MSNBC. Finally tonight on "The Ed Show," it's been 12 days since Sean Hannity hasn't answered the questions about possible fraud and misuse of funds from his charity. He may have to answer to the IRS and Federal Trade Commission. On Friday, NewsBusters editor-at-large Brent Baker noted that the Freedom Alliance was strongly refuting allegations by blogger and radio host Debbie Schlussel that the veterans charity organization founded by Oliver North and actively promoted by radio host Sean Hannity was a "huge scam." Upon an "exhaustive investigation," Tim Mak of FrumForum.com concluded in a March 19 post that there is "enough evidence to substantially rebut each of Schlussel’s claims." You can find that piece here. In case you missed this one, former Vice President Al Gore is looking for anything - any weather event at all to correlate to so-called anthropogenic global warming. During a conference call for activist hosted by his group Repower America on March 15, Gore attached blame to the recent windy and rainy weather in the Northeastern United States could be tied to global warming. "Just look at what has been happening for the last three days," Gore said. "The so-called skeptics haven't noted it because it's not snow. But the downpours and heavy winds are consistent with what the scientists have long warned about." This caught the attention of Fox News Channel's Sean Hannity. On his March 16 broadcast, Hannity pointed Gore's wisdom out for his viewers. Fox News host Sean Hannity on Thursday highlighted a story on NewsBusters showing that ABC News spent far more time on Senator Jim Bunning and his non-scandal than the network did with Congressman Charlie Rangel's ethics violations. Liberals who simply cannot understand why Sarah Palin is so popular often attribute her success to her looks. The excuse conveniently allows them to sidestep any discussion of the issues she raises, and allows them to maintain a feeling of intellectual superiority to Palin and her supporters. 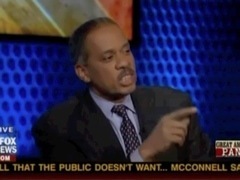 Fox News contributor Juan Williams, also a reporter for NPR and the Washington Post, was at a complete loss when Sean Hannity told him last night that he would rather Palin be president than Barack Obama. "Your libido is getting in the way of your thinking," Williams told Hannity. 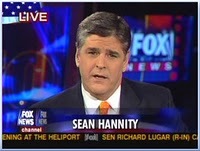 Hannity and another guest, S.E. Cupp, noted the utter sexism in Williams' remarks. But don't expect to see a press release from the National Organization for Women or any other feminist group. Palin doesn't serve the liberal agenda, so she's fair game for claims that she'd be nowhere without her looks. Sean Hannity Wednesday took on the recent attacks against conservatives made by liberal entertainers Janeane Garofalo, Bill Maher, and Rosie O'Donnell as well as the hit cartoon series "Family Guy." As NewsBusters reported Tuesday, Garofalo was on O'Donnell's radio show that day spouting disgusting invective aimed at a littany of conservatives including Hannity himself. That evening, Maher was on "Larry King Live" calling Americans "not bright enough to really understand the issues." On Sunday, Fox's "Family Guy" attacked former Alaska governor Sarah Palin with a Down Syndrome joke. With this in mind, Hannity brought conservative author Michelle Malkin on his Fox News program Wednesday to discuss unhinged liberals gone wild.